Kingsnake.com - Herpforum - Found a chameleon - advice needed! Found a chameleon - advice needed! Well, I had an interesting experience yesterday! I went to my local pet store to get food for my parrots, and as I was outside looking at their fish pond, I see what I thought was a little chameleon statue...until she moved! I picked her up and took her into the pet store, thinking she had escaped from them, but nope, they say "Not ours." Obviously someone deliberately abandoned her, as the odds of her wandering off and ending up outside a pet store are ridiculous. 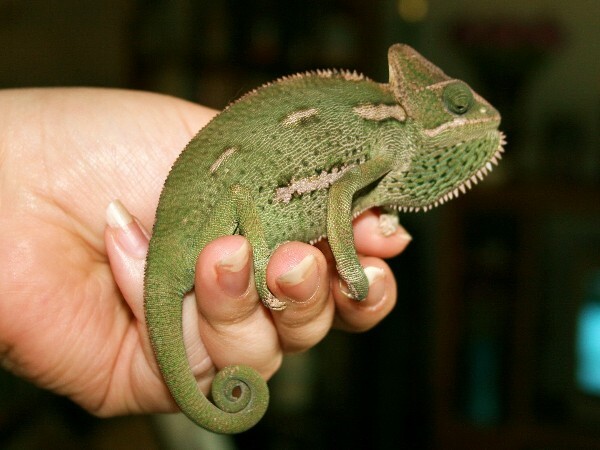 The pet store nicely gave me a canvas bag to get her home safely, and sold me some crickets for her, and now it seems I am the proud owner of a veiled chameleon. I am an experienced herp owner, had a pair of green iguanas for nearly 17 years, and currently own a ball python, a gold dust day gecko and three red eye tree frogs. This is my first chameleon, however, and I want to do right by her. 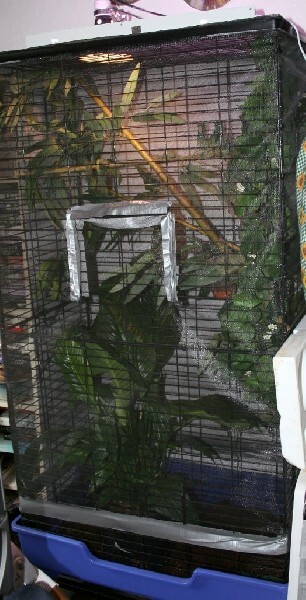 I had a very large ferret cage on hand, and encased it with screen I bought from Lowe's. Searching my storage unit, I found I had plenty of light fixtures, and I have ordered a Reptisun 5.0 for the fluorescent fixture and an infrared heat bulb for the incandescent fixture. I put a live plant in the bottom of the cage, and lots of silk greenery and branches for her to climb on. I put her crickets in a clear plastic cup they can't climb out of and affixed the cup to the branches with a twist-tie. My cricket gut-load is at my office (where all my other herps live) but I will bring some home tomorrow, and they are eating grated carrots for now until she finishes eating them. I have a dripper water system hooked up as well. She is very sweet, definitely a female (no spurs on the back feet), and seems to already be getting comfortable. So far, my questions are: I hear females will lay eggs regularly, so do I need anything special (sand, dirt?) in the cage for her to lay her eggs in? I'm assuming she needs calcium supplementation, should it be with D3 or without? I'm attaching a pic of her, is she full grown or will she get larger? 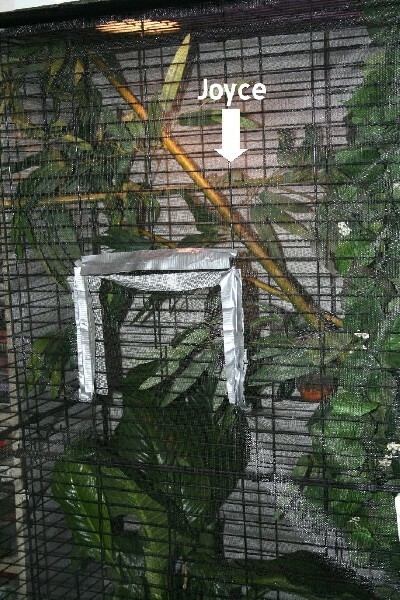 I'm also attaching pics of her cage, and as you can see, it's plenty big enough (the white arrow in the one pic pointing to that tiny green lump is actually pointing to her in her huge cage), but you can also see I had to rig a weird opening in the screen for the door, which is mainly silver strapping tape and velcro. Any ideas on how to make this look better? Is there anything else I should do for her that I am not doing? Normally I religiously research care before getting any new pet, but obviously wasn't able to here. Happily I had a lot of stuff on hand from previous herps. Any help/advice would be greatly appreciated. I've named her Joyce.